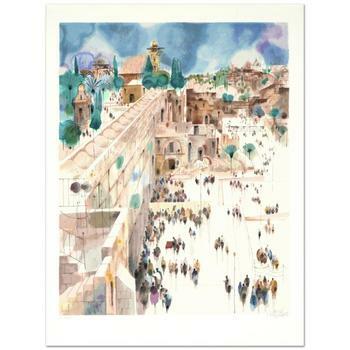 Shmuel Katz (1926-2010), "Jerusalem-The Wall" Limited Edition Serigraph, Numbered and Hand Signed with Certificate. "Jerusalem-The Wall" is a limited edition serigraph on paper by Shmuel Katz (1926-2010), numbered and hand signed by the artist! Measures approx. 26.5" x 34.5 (with border), 23.5 x 28.5" (image). Born in Vienna, Shmuel Katz (1926-2010) escaped from a concentration camp during WWII, before going into hiding in Hungary. At the end of the war, Katz attempted to migrate to Palestine with a group of illegal immigrants, but was intercepted by the British and deported to a displaced persons' camp in Cyprus. It was in this camp that Katz discovered his artistic talents. He began drawing to pass the time; shortly after, his art was exhibited in Cyprus. 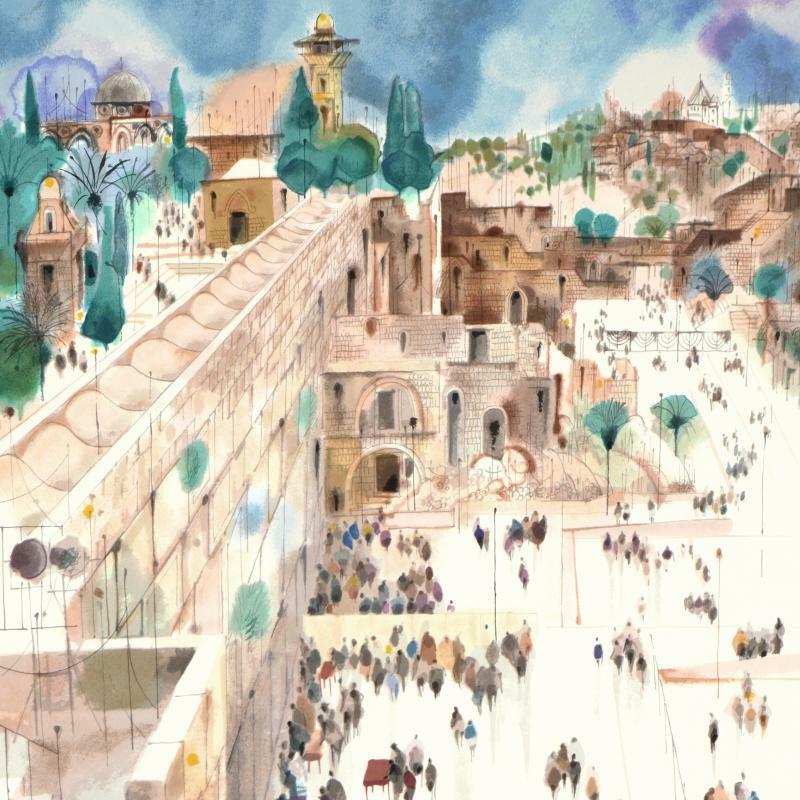 When Katz moved to Israel in 1947, he put his artistic interests aside in order to help found Kibbutz Gaaton in 1948, and to fight in the War of Independence. He did not return to creating art until the early fifties, when he was asked to illustrate a children's magazine. Later, his Kibbutz sent him to study art in Paris, to explore his artistic needs. 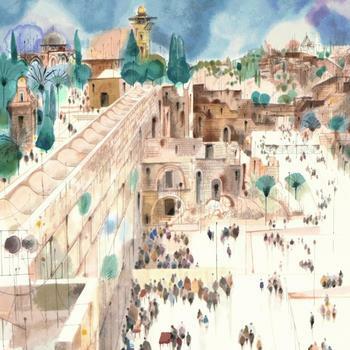 Since returning to Israel, Katz has devoted his life to drawing and painting, while remaining loyal and active within the Kibbutz. Shmuel Katz has developed a style which is playful and yet pays acute attention to details. He breaths life into his paintings through contouring lines and the perception of depth. Katz has developed a mature and deeply personal style that expresses a wealth of themes and technical devices that make his work so unique and poetic.